Kris will describe the evolution of Baylis Medical starting from a distributor of specialized medical devices in Canada to a developer, manufacturer and distributor of medical devices global basis. Talk will be centered around key technologies developed by Baylis over the last 15 years, concentrating on development and commercialization of these technologies. 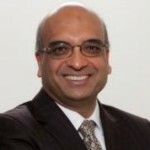 Kris Shah is the president and a co-founder of Baylis Medical Co., a leading developer, manufacturer, and distributor of specialized medical devices. Baylis Medical specializes in interventional cardiology, radiology and spinal products. Their products are distributed on global basis with offices in Montreal, Toronto, Vancouver, Boston and London UK. Baylis divested Spinal Pain Management business to Kimberly Clark in 2009 and Bone Tumor Ablation technology to Medtronic in 2016. Baylis acquired Fralex Therapeutics (TSX: FLX) in 2009. Kris is an active board member for Colibri Technologies and Intellijoint Surgical and former board member Venture Lab, MEDEC, and Business Advisory Committee of HTX. Kris received Alumni Team Achievement Award in 2014 from University of Waterloo and EY Entrepreneur of Year award in health services Quebec in 2011. Kris received BSc in Electrical Engineering from University of Waterlooin 1986.